Looking for the Top 10 drones under $300? Look no further, we at DronesWorld have researched and compared all commercial drones currently in the market within this price range. We hope this helps you deciding which best fits you. However, if you are looking for more great drones at a lower price please check our Drones Below $200 list. On the other hand, if you have some extra money to invest on a high-end product we have also compiled a Drones Below $500 and The low-cost drones below $100 list. Table : What is the best drone under $300 ? Note: Top 10 Drones under $300 List has been updated with the latest drones released in early 2018. We are going to start this list off with Zerotech Dobby, one of those awesome selfie drones that sport excellent cameras and thrilling all-around stability as well as performance. It’s not that expensive either, especially thanks to recent price drops that make it among the most affordable smart selfie drones out there. So, as the first (or, should I say last) entry to our list, it’s only logical that we take a closer look at it and see how exactly does it compare with other similarly priced drones on the market! Zerotech Dobby is a miniature model that can be folded to occupy only 135 x 65 x 34 millimeters. When unfolded, it stretches out to 135 x 145 x 34 millimeters which is quite the difference. With those numbers in mind, Zerotech Dobby can be considered a proper pocket-friendly drone that you can take with you everywhere you go. Just like the title of this paragraph suggests – Zerotech Dobby is small but offers great performance. In fact, it can fly around for up to 8 minutes and reach all the way to 100 meters away from its controlling smartphone. Those are pretty good numbers if you don’t mind me noticing! If we take into account the fact that Zerotech Dobby is a fully fledged selfie drone, it comes as no surprise that it sports a mighty camera. More precisely, we are talking about a powerful 13MPX sensor with facial recognition, target tracking and even follow me capabilities. Furthermore, there is EIS incorporated in the story too, allowing you to record smooth aerial videos in 1080p. If you’re not worried about shakiness and jello effect, Zerotech Dobby camera is able to output 4K videos as well! It is probably not the best drone under $300, but Zerotech Dobby definitely deserves it’s spot on our list! Holy Stone has adopted a very familiar design we are seeing with lots of premium grade models including the ever so popular DJI Phantom series. However, it’s not the only similar looking drone – Syma X8 series, as well as Upair One models, are pretty similar as well. It’s nothing surprising though – this frame design not only offers true X motor placement but does a great job in terms of power efficiency. And trust me, HS300 needs every last bit of power efficiency considering it sports powerful motors as well as a bulky camera. The overall weight isn’t too high but is still sitting strong at 635 grams. A big part of that falls to the battery as well as that sweet looking action camera that actually shoots in 1080p at solid 30fps. Specifications are bit part of every drone, but they’re even more in the spotlight when it comes to cheap ones. However, there’s no need to worry since Holy Stone HS300 delivers a fine performance. Even though it falls a bit to the heavy side, this huge drone can still keep flying for up to 15 minutes, even with the camera mounted on. Combine that with approximately 150 meters of operating range and you’ll realize you got yourself quite the deal here! First, let’s get rid of the elephant in our room – MJX Bugs 3 does not come with a camera! Even though there are 3rd party models that bundle this little bugger together with an action camera, if you want the original model it will come without one. However, what it will come with is a simple mounting bracket that can fit all sorts of action cameras including the highly popular GoPros. While this might be an issue for some people (read those who don’t already own an action camera), others will gladly support it. It’s a matter of personal choice and allows wannabe professional aerial photographers to pair this birdie up with any camera they want. It’s a genius move by MJX and one that basically made Bugs 3 as popular as it is nowadays! Features aren’t exactly a strong suit to MJX Bugs 3. It doesn’t have altitude hold meaning you will have to control it manually all the time. On the bright side, it does sport low voltage protection as well as 3D flips which are outright awesome to perform with such a bulky drone. And it’s all well deserved – MJX Bugs 3 is the best entry level aerial photography platform despite it’s lacking a camera. It is highly stable, has decent specifications, won’t make too big of a dent in your budget and allows you to mount a wide variety of action cameras on it. What more could you wish for?! 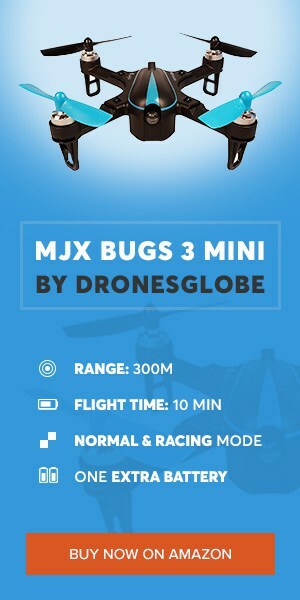 In terms of actual specifications, MJX Bugs 3 can reach up to 300 meters away from its transmitter. It might not seem like a lot to you at first, but I doubt you’ll even be able to see it at such a distance unless it’s in a clear area and flying relatively high. As for battery duration – MJX Bugs 3 carries a 1800mAh LiPo battery that gives it up to 15 minutes of flight time per charge. Not bad… Not bad at all, don’t you agree that MJX Bugs 3 deserves it’s spot on our drones under $300 list? Now we are up against a highly interesting drone that’s going to leave some of you very puzzled. As you can see from above, I am referring to Traxxas Aton. It’s a gorgeous drone with powerful hardware and a simplistic and very responsive transmitter. But, the thing that sets Traxxas Aton in front of virtually all competitors is its dedicated flying mode… well, 3 of them to be more precise. What’s so special about them? Hmmm… where should I start?! Let’s rewind that for a second – Traxxas Aton sports 3 flying modes – Photography, Sports, and Expert. The first 2 are pretty much self explanatory – Photography allows for smooth flying with the limitation being set on the drone’s top speed and maneuverability. Sports mode, on the other hand, gets rid of all those limitations and lets Traxxas Aton prove its worth. And my oh my, does this thing go fast… All the way up to 70mph which is absolutely amazing. But it’s not a thing to be surprised about by any means – this thing rocks a potent battery slapped together with impressively powerful brushless motors. Combine that with a generally lightweight design and a great custom-made flight controller and you’ll realize what’s Traxxas Aton all about! When it Sports mode, you will probably want to remove those landing legs as they’ll be too much of a burden on your way to the top speed. However, if you’re thinking of recording some good old aerial footage, trying to fly without them is going to be a no-no. That’s because Traxxas Aton (well, more precisely Traxxas Aton Plus bundle) packs a sophisticated 2-axis gimbal which is quite bulky and needs a lot of space since it’s mounted on the traditional place – on the drone’s bottom part. Even though it’s bulky, it still doesn’t affect the overall battery duration which can still go up to 15 minutes. Operating range is solid as well, stretching out to around 200 to 300 meters which is quite decent for a drone of this caliber. Holy Stone HS100 comes with a solid set of features, most important one being altitude hold. Additionally, there are also the likes of adjustable speed, GPS, headless mode, follow me and even FPV. Talking about FPV, Holy Stone HS100 comes with a solid 720p camera mounted in a very interesting way. You see, it’s slapped on a motorized mount that can be tilted upwards and downwards. This will enable you to get the best scene on your aerial journeys from the comfort of the provided transmitter. If you are worried about the specifications, there’s absolutely no need for that. Holy Stone HS100 can stay in the air for up to 15 minutes and go all the way to 500 meters away from its transmitter. FPV-wise, make that roughly 150 meters after which you’ll end up losing connectivity. Sadly, Holy Stone HS100 suffers from a rather weird problem that doesn’t seem to be present with other similarly priced drones… You see, instead of power efficient and extremely durable brushless, HS100 comes with brushed motors. They are the highest of quality, but still can’t be compared to a set of brushless ones. What this means for the average user is that they will die much sooner than what would be the case with their brushless counterparts. In other words, HS100 users will have to spend more money in spare motors. It’s not the end of the world but still a downside nevertheless! Now we are up for a very special drone which was, in fact, the first proper racing drone I ever owned. It goes by the name Eachine Wizard X220 and it’s, by far, the best 220mm beginner’s racing drone. The main characteristic of this one is its durable frame which isn’t prone to breaking even after several high speed crashes. In addition to that, there are also powerful brushless motors, decent FPV camera and a powerful 3S battery that comes with the basic package. If Eachine Wizard X220 seems interesting, make sure you stick around and read more useful inf0rmation about it. Yes! I already mentioned this above but I suppose it won’t hurt to say it again – Eachine Wizard X220 is a brilliant beginner-friendly racing drone. That’s because it’s based on Naze32 Rev6 flight controller, has 20A ESCs paired together with powerful 2204 2300kV Eachine branded brushless motors. Generally speaking, this drone is an absolute beast and best of all – it comes as a ready to fly model. This means it sports everything you need to start flying right out of the box, including a 3S 1500mAh LiPo battery as well as FlySky FS-i6 transmitter. The biggest problem you will end up having with your first racing drones is the fact they’ll break easily… and frequently, as a result of crashes, and trust me – there will be plenty of those before you turn into a proper acro flyer. However, this might not be that frequent with Eachine Wizard X220 due to its rather durable frame. As you can see from the image above, this racing drone features thick prop arms as well as a fully enclosed internals. While this does give it some extra weight which puts more strain on the battery, as far as durability is concerned it’s one of the best affordable racing quads out there. Hubsan H501S was a hair short of the bronze medal which is reserved for a far more popular birdie. But, all eyes on this little bugger now as it won’t disappoint its buyers either. Hubsan – perhaps not one of the biggest names in the industry, but a brand which surely knows its way around drones. However, knowing their top-flight model (H109S) didn’t fare well against its competitors, it seems as though Hubsan should stick to affordable camera birdies… and their H501S seems like the perfect formula for success! One of the reasons for such a huge success this drone has had in the recent year or so are its powerful motors. As the title of this paragraph implies, we are talking about brushless ones with extra power efficiency and a whole ton of additional durability. They also add to the overall stability of the drone itself, allowing it to record fine aerial videos with its 1080p built-in camera. There is no gimbal here but the videos recorded with this beauty are still good. Take a look on YouTube and you won’t be disappointed, I guarantee it! There is no doubt that the best thing about Hubsan H501S is the sheer number of implemented features. Of course, the main one is GPS which does a brilliant job of making this little bugger as stable as it can be. However, there’s more to it than a mere navigation system – Hubsan H501S also has access to follow me, headless mode as well as an automatic return to its initial takeoff location. In terms of specifications, Hubsan H501S is standing good, no question about it. This little camera birdie can travel up to 300 meters away from its fancy transmitter with built-in 4.3-inch FPVdisplay. And finally, it can stay up in the air for approximately 18 to 20 minutes which is miles ahead of other similarly priced models. Parrot is a well-known drone manufacturer with plenty of top-tier drones to their name. Today, we won’t be focusing on their toy-grade solutions. Instead, we are going to take a closer look at one of their best selling models which goes by the name Bebop 2. There is an abundance of versions available, but the only one which fits our price point for today is the standard one. What’s missing with it? Well, that and plenty more information regarding this awesome smart drone is available down in the next couple of paragraphs! Thanks to its main features (GPS and altitude hold), it is clear as day that Parrot Bebop 2 is a highly affordable smart drone. Plus, it also sports some added reliability in the form of automatic return to home which will save you a lot of nerves if you happen to have trouble bringing it back to where it took off. Another noteworthy thing to mention about this little bugger is its exceptional full HD camera that comes packed with FPV and EIS. While the former will allow you to fully immerse yourself into the whole drone-flying experience, the latter will allow your footage to be buttery smooth no matter the weather conditions. Unfortunately, for less than $300 you can only get the basic version of Parrot Bebop 2. Why is this unfortunate, you may ask… Well, the basic version of this drone doesn’t come with the SkyController 2. Why might you like that? Well, with SkyController 2, Parrot Bebop 2’s default range is drastically increased to roughly cca 2 kilometers which is, needless to say, a huge step up from the very limited default range. As for the battery duration, they are the same with both versions and last around 20 minutes per charge. The runner-up for the title of the best drone under $300 goes to Upair One, an outright amazing drone with impressive aesthetics. These aesthetics are actually a big part of its popularity, even though the rest of its package is exceptional too. The biggest virtue of Upair One is definitely its affordable price tag and smart features which will introduce you to the world of professional aerial photography. The first thing that you’ll notice once you lay your eyes on this little fella is that it’s an absolute beauty. It sports a glossy white finish with virtually no visible decals making the entire package be as stylish as it can. The transmitter is all white too, sporting a 7-inch LED display for FPV purposes. Now that we’ve had aesthetics out of our way, it’s time to take a closer look at the available aerial photography solutions. When it comes to Upair One, you are free to choose between 3 types of cameras, with the only real difference between them being their maximum resolutions. In other words, you will have to choose between 1080p, 2.7K and 4K cameras, all of which are securely mounted on a sophisticated (yet very simple) anti-vibration camera bracket. Specs are an important part of every drone and Upair One it’s pretty clear that Upair One is doing itself justice with up to 600 meters of operating range. What about flight time though – if the operating range is so good… does that mean there were manufacturing cuts with flight time? No need to be worried guys, Upair One has a pretty good flight time too. Well, it’s all thanks to a hefty 5400mAh intelligent LiPo battery which can carry the drone along with its dedicated camera for approximately 15 minutes per charge. At last, we have reached the ultimate drone that you can buy for less than $300. MJX Bugs 2W is the name and, my oh my, does this thing perform amazingly well no matter what you want from it. You want a beginner-friendly drone with a great camera – check! You want a reliable GPS drone with auto return – check! You want a speedy little devil – check! MJX Bugs 2W has it all and has every right to claim the throne as the best drone under $300. The best drone with camera under $300 ? Let’s start off with this little bugger’s camera, shall we?! For starters, we are talking about an FHD CMOS sensor with wide angle lens for the ultimate panorama views from far above the skies. Unfortunately, MJX Bugs 2W camera does not have EIS… but it sports 5Ghz WiFi FPV which stretches out to quite a distance. Want to know the exact FPV reach of MJX Bugs 2W? Well, I’m afraid you will have to carefully read the next paragraph to find that out. This leads us to features – no need to worry about little bugsie here since it comes with a whole bunch of them. GPS and GLONASS are leading the charge with reliability features (3 types of return to home) being right behind them. There are also headless mode, altitude hold and video recording features which are all highly intuitive and simple to use. In addition to the outstanding camera, the main reason why MJX Bugs 2W is placed at the top spot here are its unparalleled specifications. A highly affordable price tag is a good selling point too… but the specifications are just too damn good. With that being said, this camera drone under $300 can survive up to 18 minutes in the air which is on top of the food chain as far as its price point is concerned. But that’s nothing compared to its operating and FPV ranges. Operating range stretches all the way out to 1 kilometer while FPV can go up to 500 meters, but that’s heavily depending on the type of smartphone your experiencing FPV through. Smartphone controls vs transmitter controls? The best thing about smartphone-controlled drones is the fact they free you from having to carry a separate controller with your drone. That’s because most of these drones are compact, foldable and basically made with one thing in mind – get you to carry them with you everywhere you go. The thing with transmitter-controlled drones is that they offer a much longer operating range and are more responsive than smartphone-controlled ones. Physical controlling adds a special charm too. However, you will have to carry the transmitter along with your drone which can be bulky. As far as the camera is concerned, it all depends on how important is it for your particular needs. FPV racing quads such as the Eachine X220 aren’t exactly known for having great HD cameras. Instead, they have miniature ones that transmitter analog signal with virtually no latency. However, if you are aiming for an all-around beginner’s drone under $300, then you shouldn’t settle for anything below full HD aerial recording resolution. In terms of features, the situation on drone market is really diverse. Some drones will leave you disappointed by featuring only the most basic of features such as headless mode and adjustable flying rates. On the other hand, there are also cheap under $300 drones that feature GPS, GLONASS, altitude hold, facial recognition and even some more advanced autonomous flying features. At this price point, the majority of drones featuring FPV will have that cheap WiFi FPV system which can’t go that far away from the source. However, some higher end models featured here (I am referring to MJX Bugs 2W here) sports 5Ghz WiFi FPV which is still WiFi but has less latency and can go much further than traditional 2.4Ghz WiFi. Last but not least, some models sport 5.8Ghz analog FPV which doesn’t have any latency at all but is based on a lower quality analog feed which doesn’t look that pretty. As always – it’s up to you to make the decision which FPV system will work the best for you. Now we are approaching the official numbers (read specifications) of drones below the $300 mark. So, the first one is flight time and as everything other explained here – it is horribly diverse too. Starting from those petty selfie drones you will notice their flight times are only a couple of minutes, 10 at the very max. On the other hand, bulkier models such as MJX Bugs 2W can fly close to 20 minutes which is a huge jump nevertheless. So, as far as the average flight time of drones below $300 is concerned, I’d say that number goes somewhere around the 15-minute mark. Operating range heavily depends on which type of drone we are talking about. Once again, selfie drones are the weakest link just like it was the case with flight times. These miniature foldable models can travel up to 100 meters which is not that far for today’s standards. On the other hand, bigger models usually come equipped with better receivers and they tend to go all the way from 300m to 800m… even more in some cases. Don’t become too attached to your first drone! If there’s one thing all this experience with other newcomers to this hobby has learned me… it’s that everyone gets too attached to their first drone. And this can be a problem for many people as their wishes and needs drastically drift from their initial ones before their first drone purchase. I myself was a victim of this. Back in the days, the first drone I ever owned was XK X250 – a 1S brushed quad, basically a copy of the highly popular Traxxas Alias. It was fast, agile and had 5.8Ghz FPV transmission which was a thrilling feature for newbie me. And needless to say, I got overly attached to it up to the point of buying a whole ton of spare parts and afterward almost ending up buying a second one after my first broke. Hmm… it seems as though I strayed too far offtopic here. Basically, what I’m trying to say here is that I almost ended up rebuying my first drone simply because I got overly attached to it. Don’t be like that – let your first drone be a learning platform for shaping your experience and expectations for future models. That’s how it’s meant to be in this hobby, mark my words! Quadcopters under $300 are plentiful and come in a whole heap of shapes and sizes. All the way from miniature selfie drones up to proper 300mm+ beasts capable of carrying GoPro’s and similar action cameras. So, with that being said, it’s pretty clear that drones at this price point have enough versatility for each and every single one of you. I’m sure you will be able to find a drone catered specifically to your needs with the above-featured models greatly aiding in your search. In the end, I would also like to thank you for reading and hope to see you again soon! What do you think of this drones? Which one is your favorite? Are you considering buying one? Let us know in the comment section below. We at DronesWorld are always happy to hear from you! The Upair One has some reliability issues. I think the MJX Bugs 3 is a better option than the Upair. It’s more affordable and reliable although it doesn’t have a stabilized camera gimbal.